The plants in my garden need to be more than just pretty faces. These three non-natives provide much needed nectar and/or pollen in mid/late fall when many native plants have gone to seed. My garden continues to be mostly native, but I believe that adding pollen and nectar rich non-natives enhances a pollinator habitat. 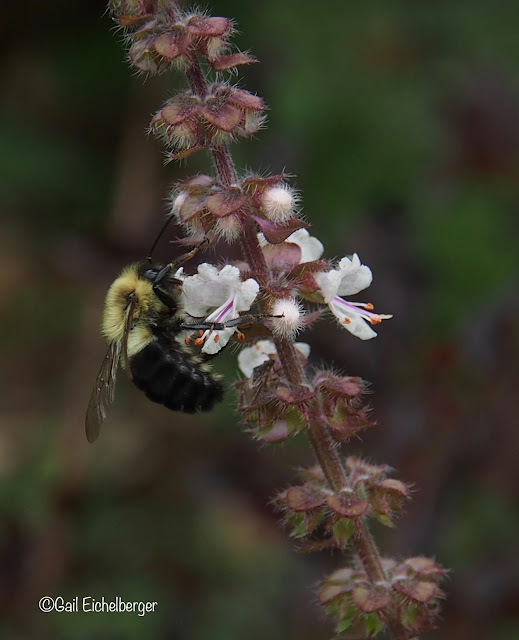 Our growing season is long; bees that are provisioning their nests for the winter and migrating butterflies and hummingbirds need the extra blooms that they bring to the garden. They also have very pretty faces. Of course, you all know that the very best thing you can do for bees and other pollinators is to never, ever, ever, ever use pesticides! 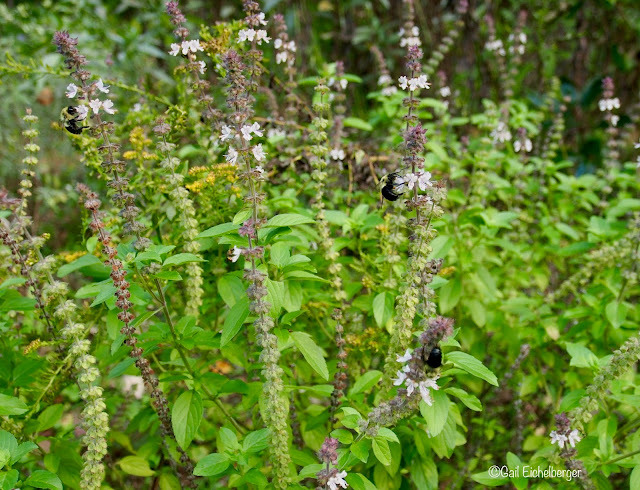 For long bloom and a fantastic pollinator buffet, plant African Blue Basil. It's a sensory treat of pretty flowers, buzzing bees and fragrance all summer long. It's a tender perennial and blooms non-stop...Well, until a freeze stops it. It's not an easy plant to find, but, worth the trouble to locate it. 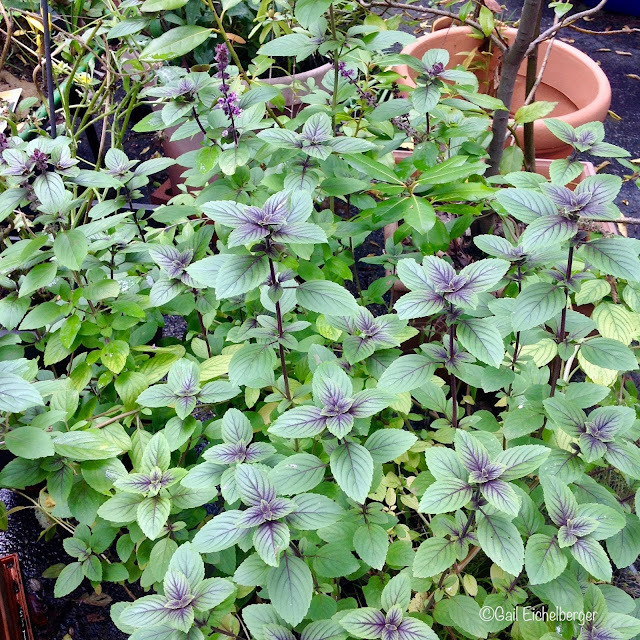 The leaves of African blue basil are purple when young and folks claim that it makes a wonderful pesto! I'll never know because I am growing this beauty for the bees. Oh my gosh, is this ever a buffet for bees of all sizes. Comments: It's sterile and never sets seed, so I will take cuttings and hope they make it through the winter. It's taller than most basil plants and if that bothers you, pinch the tips and it will remain shorter and fuller. This should be in every pollinator garden...It's blooming now and has been for months. 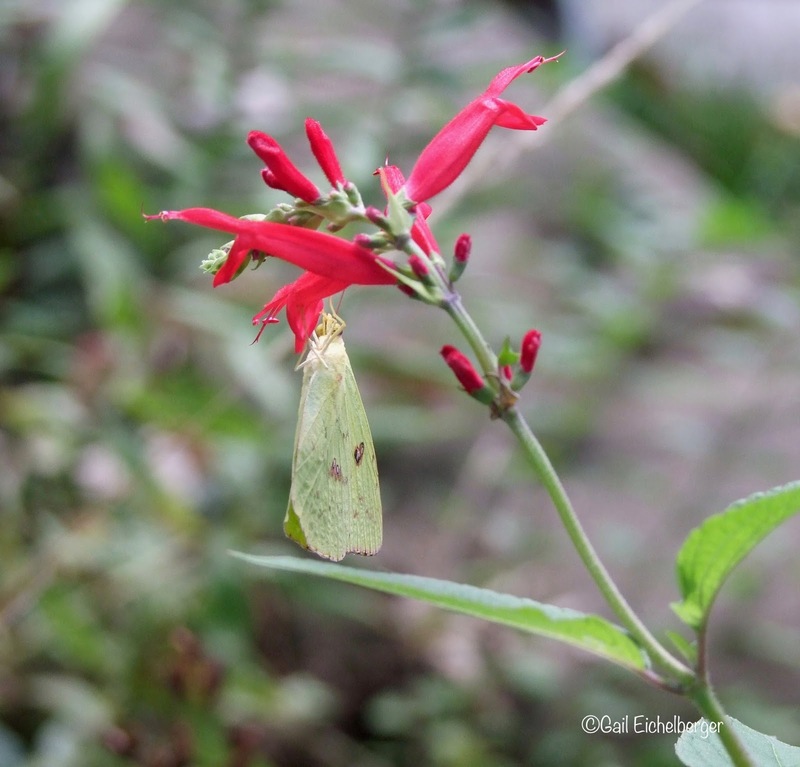 Another must have for my garden is the late blooming Pineapple sage. This fabulous native of South America blooms in early fall just when the garden needs a jolt of delicious red and the hummers moving south need nectar to fuel their flight. Salvia elegans is another culinary plant that I haven't brought to the table! I can't imagine picking the flowers (even if they are said to be tasty in a salad) after waiting all summer for them to bloom. Once they bloom the Cloudless Sulphurs are all over them. That's one reason they're in my garden. The other one is that they are attractive to hummingbirds and are blooming when they migrate through middle Tennessee. 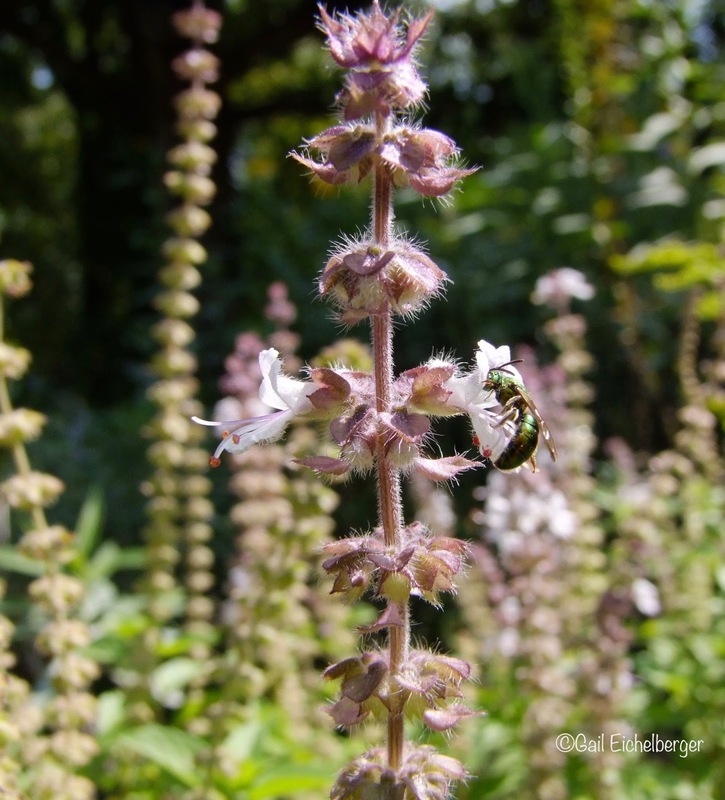 I think of Pineapple sage as a hummingbird and butterfly plant and was surprised to see this bee nectaring. Pineapple sage are fast growing, but slow to bloom. I tuck them into the Susans Bed and patiently wait for the fall show. The 3 inch plants I planted in spring are 3 foot tall and 2 foot wide with bright green leaves that are a foil for the scarlet red flowers. In a sunnier garden with moist soil they can reach sub-shrub size. 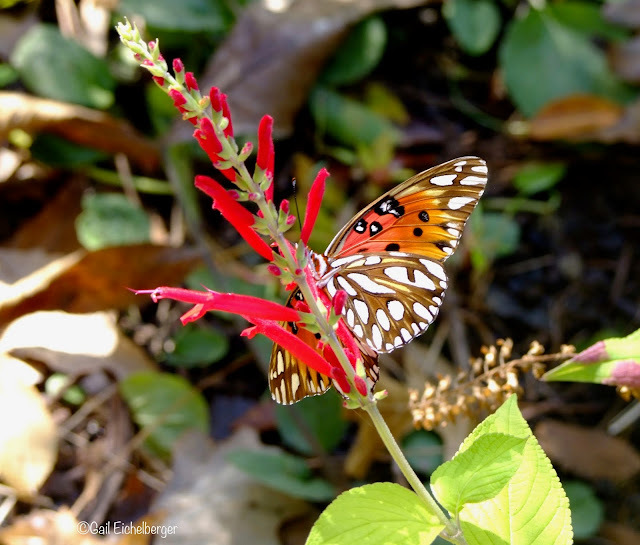 This season there have been butterfly, hummers and bees nectaring on the scarlet blooms. Critters beware! A Crab spider is lurking. Comments: An easy peasy plant for middle south and southern gardens. Folks gardening further north might have to move it inside to appreciate the bloom. They may bloom too late for hummers, but, you can enjoy the beauty and add the flowers to your salads. I have been known to cover them when a frost is forecast and warm weather is expected to return. 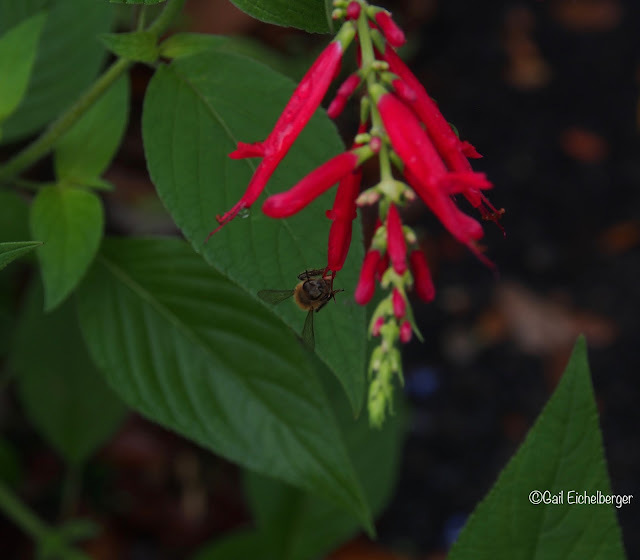 Salvia x 'Mystic Spires' is a third must have supportive player for my wildlife friendly garden. Bombus pennsylvanicus is my guess, but it is only a guess! This is a stunning blue flower that looked wonderful with the Golden Asters that bloomed in September. I don't plant this in the garden, but into containers that I strategically place in the garden. 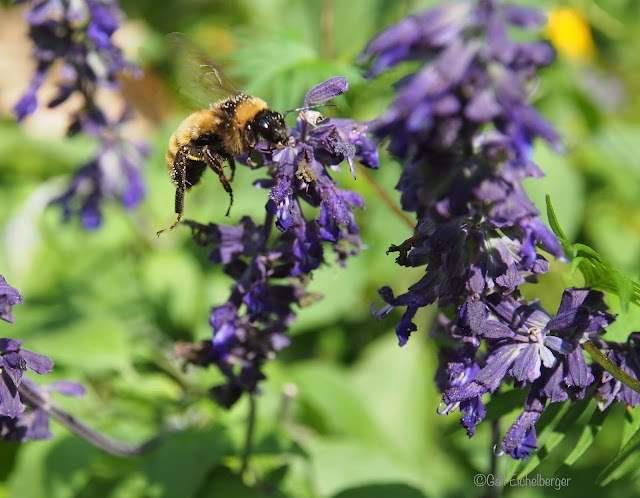 The nectar rich flowers attract a variety of pollinators including hummingbirds, butterflies, and a variety of bees, but especially bumblebees in my garden. A month of 90+ weather didn't stop 'Mystic Spires' from flowering. I expect it to flower until we have a freeze. You can be sure I will cover this one if warm weather is forecast to follow a freeze or frost! I am hoping it will overwinter, because this is a fantastic plant for a critter friendly garden. Height 3 ft. to 6 ft. Spread 1 ft. to 3 ft. Comments: Is happy in a container. Might overwinter if winter drainage is good in Zone 7. If it looks scraggly or needs to be refreshed, just cut it back, more blooms will follow. PS Now make this garden blogger smile and pop over to May Dreams Gardens, where our delightful hostess, Carol, has set up the Mr Linky magic carpet ride to take you to more Bloom Day posts than you can imagine. Love those garden workhorses. I have had them all at one time or another and I do believe that those pesky deer do not like any of them. Win! I think you're right they are deer proof! Bonus points. Thank you. I like it, too. HA! I bought very few plants this year -- just a few annuals. The first on my list was pineapple sage. The scent of the leaves! I'm going to try all three next year. I love all the salvias, and I haven't had Pineapple sage in such a long time. If the deer don't like them, I will really be happy. I wonder if pineapple sage would even bloom for me? I find a lot of tender perennials want more heat than my climate gives them. We had our first frost this morning, so all three of these would be gone from my garden. But the point is well taken, keep flowers blooming in your garden for as long as you can! I used to find pineapple sage every spring but no longer see it offered around here. I love salvias. I have Mystic Spires too. It is in a spot that doesn't get full sun and it has bloomed all summer. Great plant. The basil looks pretty even with out any blooms. I grow basil for its looks, not to cook with--this variety is lovely! 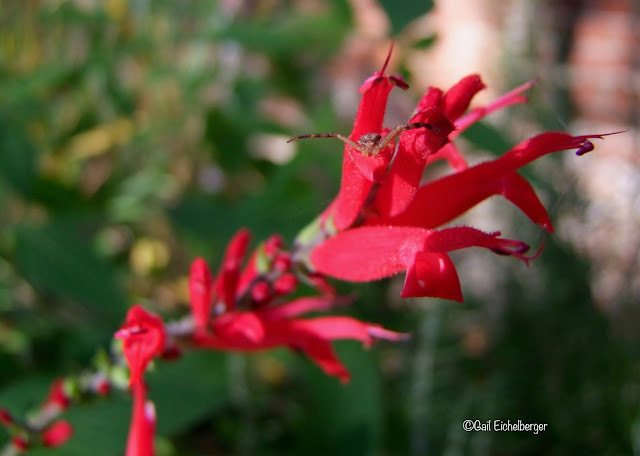 I love pineapple sage; I only wish it bloomed earlier. Usually I'm lucky if I can enjoy its blooms for a week before it gets zapped by frost. 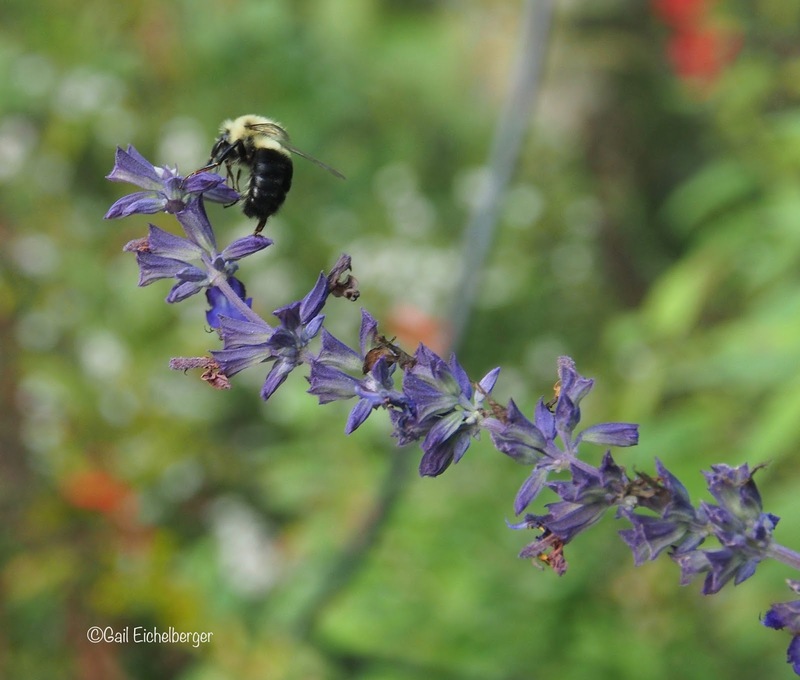 I don't have 'Mystic Spires,' but lots of other salvias in the garden, and I agree the bees love them. The 'Black and Blue' and 'Wendy's Wish' are big favorites of the hummingbirds as well. Great post...your photographs are beautiful. I am growing the African Blue basil also. It has over grow so much we had to cut it back. We dried the leaves in our new dehydrator. I didn't even think of pesto. The bees do love it! Have not tried Pineapple sage but will look for it. We have Salvia Miniata and it blooms from spring to fall. It died back in our super freeze last winter but came back just fine. The red is so bright I can't seem to photograph it. I'm always looking to extend the life of my gardens and bring in more fall color. Thanks for the tip! Jealous - Zone 5 (updated from zone 4 a year ago). Gairl - Your garden is beautiful. 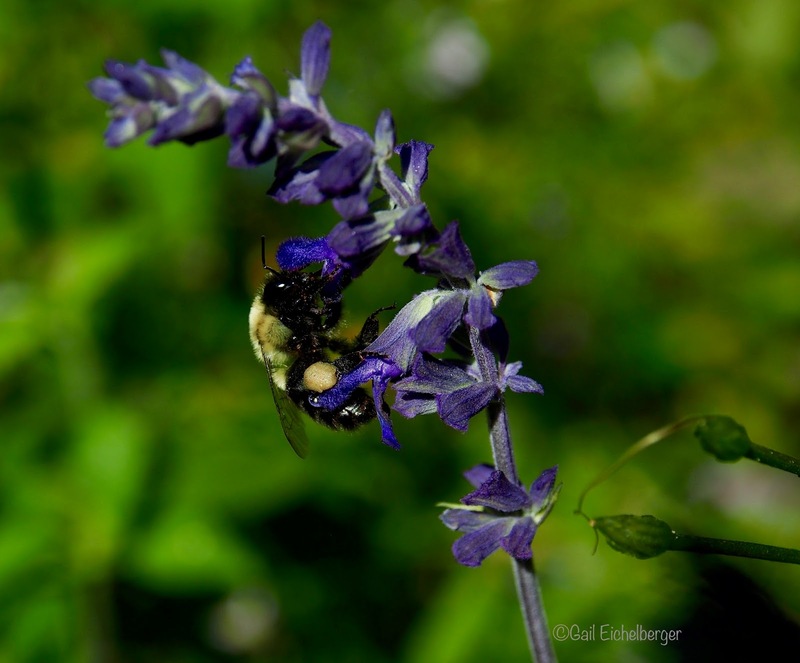 I am working with 2 groups planning and planting pollinator plants in 2 public gardens. The emphasis is on native plants, but I don't think we need to be purists because as you have illustrated there are other non-invasive flowers that really keep the pollinators happy.